2004 - documentary - 52 min. For centuries, a remarkable group of seafaring nomads known as the Moken has lived quietly in the idyllic Mergui Archipelago off the southern coast of Burma, sleeping on their boats and existing in harmony with the natural world. Now, though, the peace has been shattered, and the islands and their people are under threat from loggers, fishermen, entrepreneurs and the government. 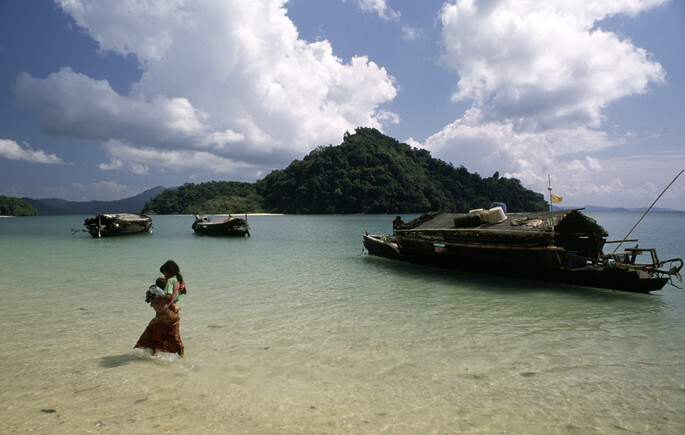 The Mergui Archipelago of southern Burma is one of the last paradises left on earth. Cradled by pristine reefs, most of the eight hundred islands are untouched and uninhabited except for an outstanding array of rare birds, fish and animals. They are home to a remarkable group of people known as the Moken sea gypsies; seafaring nomads who subsist on whatever the tide reveals to them day after day, entirely in tune with nature. The Moken way of life is based on the tides and the cycle of the moon. Only a few hundred true free roaming sea gypsies are left in the Archipelago. The Nyaung Wee Moken, a flotilla of 10 boats and 30 people, move from bay to bay, living on their boats for most of the year. They refuse to use fishing nets, and rather hunt in shallow water spearing fish and collecting oysters. Their language is unique and does not exist in any written form. Long forbidden to outsiders by the Burmese government, this archipelago of untapped riches faces a growing invasion of settlers, loggers, fishermen, tourists and entrepreneurs, all eager to make their fortune. These invaders bring havoc in their wake. For 6 months, we join clan leader Unying and his extended family of the Nyaung Wee flotilla as they confront illegal loggers and government patrols who invade their islands. We join their hunting expeditions above and below water and share their pain as Abbey’s daughter Api becomes ill. Relying on centuries-old customs and traditions, they invoke the spirits' help in healing ceremonies to ensure their survival in such precarious times.